Mumia Abu-Jamal Moved from Prison to Intensive Care, Supporters Seek Access and Answers | Democracy Now! professor of history at Baruch College-CUNY and one of the coordinators of the Campaign to Bring Mumia Home. Imprisoned journalist and former Black Panther Mumia Abu-Jamal has been taken to the intensive care unit of Schuylkill Medical Center in Pottsville, Pennsylvania, after he was removed from prison for a medical emergency without any notification to his family, friends or lawyers. Prison officials told his supporters he is in diabetic shock. We get an update from Abu-Jamal’s longtime friend, Johanna Fernández, who first discovered he was in the hospital Monday morning when she went to visit him in prison and was told he had been taken to the intensive care unit. 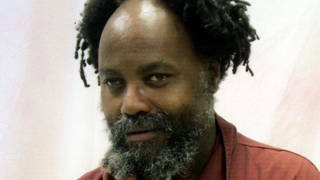 Fernández is a history professor at Baruch College-CUNY and one of the coordinators of the Campaign to Bring Mumia Home. AARON MATÉ: We end today’s show with news imprisoned journalist and former Black Panther Mumia Abu-Jamal has been taken to the intensive care unit of his prison hospital in Pottsville, Pennsylvania, after he was removed from prison for a medical emergency without any notification to his family, friends or lawyers. AMY GOODMAN: For more, we’re joined by Mumia Abu-Jamal’s longtime friend Johanna Fernández, who first discovered he was in the hospital on Monday when she went to visit him in prison and was told he had been taken to the intensive care unit at Schuylkill Medical Center in Pottsville, Pennsylvania. Welcome back to Democracy Now! We only have a few minutes, but what do you understand has happened to Mumia Abu-Jamal? JOHANNA FERNÁNDEZ: Well, Mumia has had a longstanding situation. Over the last three months, he developed a severe eczema outbreak. He describes his skin as akin to that of an elephant’s. It’s been raw, bleeding. He was in the infirmary for approximately a week within the hospital, approximately a month ago. So, that means that he’s been undergoing medical examinations, or at least we’ve been told. Yesterday, he underwent a diabetic shock. JOHANNA FERNÁNDEZ: Because the prison informed his wife, Wadiya Jamal. When we arrived at the prison, we were informed that we could not visit him, and pressured the prison to tell us what was going on. They finally said, “Well, he’s been hospitalized,” but would not release information. AMY GOODMAN: Not in a prison hospital, but in the local hospital. JOHANNA FERNÁNDEZ: Not in a prison, in a local hospital, Schuylkill Medical Center in Pottsville, Pennsylvania. So, right now, Mumia is sequestered. He hasn’t been seen by any of his attorneys or supporters or next of kin. AMY GOODMAN: His brother, Kevin [sic] Cook? JOHANNA FERNÁNDEZ: Keith Cook, for the past 20 hours. Pam Africa, Ramona Africa, they all drove there from Harrisburg, where the case of the silencing act was being heard before the Third Circuit Court. Immediately after that ended, they rushed up to Pottsville. And the doctors will not speak to us, and they won’t release any information to the family. Meanwhile, Mumia is shackled, probably, to a bed. There are four guards, a phalanx of guards, guarding him and keeping us from the room, 10 feet away. We were able to see that he was behind this room. AMY GOODMAN: What do you feel needs to happen? JOHANNA FERNÁNDEZ: We need to defend Mumia’s life immediately. He’s in enemy territory right now. And we need people to call the hospital, Schuylkill Medical Center in Pottsville, Pennsylvania. We need people to call the prison and demand that he be seen by outside doctors to really assess the situation. AMY GOODMAN: Johanna, we have to leave it there. I thank you for being with us, Johanna Fernández, professor of history at Baruch College-CUNY, one of the coordinators of the Campaign to Bring Mumia Home, it’s called.